Once upon a time there was a Chestnut tree. Not a horse chestnut with conkers, but a sweet chestnut with nuts you can eat. He lived in a park that surrounded a great house where a baronet lived. He hadn’t been born there, mind; he had been brought in and planted as a seedling when he was just two or three years old, one of four who became like brothers, pollinating each other and producing nuts for all to enjoy. It didn’t take long for him to grow into a fine, tall tree, standing in his quarter of the lawn on the East side of the house. In the summer people would come and sit in his shade. Ladies with parasols, holding onto their swain’s arms. Elderly dowagers giving advice to the next generations. Best of all, children would chase their wooden hoops around him, or have races, or occasionally when their clothes were not too restrictive, turn upside down doing handstands or cartwheels. Then in the autumn the children and the servants would come and gather his nuts, and take them indoors to roast on the fires they had there. He knew this because he heard them talk about what they were going to do, and even though that meant none of his nuts would sprout and become new trees, he didn’t mind because he loved the people who lived there and liked to make them happy. However, things had started to change in more recent years because the current baronet, the twelfth, hadn’t ever got married. Gradually all the children who used to come and play had all grown up, and had moved away. There were no children in the house, so none came to visit either. And then the baronet had stopped paying for a gardener to keep this part of the park looked after, so the lawn didn’t get cut and young saplings had been allowed to grow up around him. Fast growing trees, like sycamore and ash and birch. 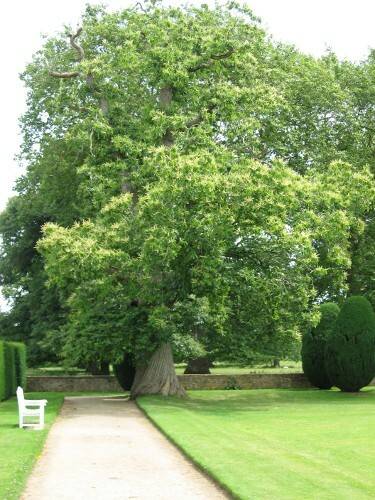 At first the Chestnut tree had tried to welcome the new young trees as they grew, and be friendly, but it was hard when he was so much older and therefore larger than they were. They complained about him blocking out their sun, because his crown was so much wider. Or taking all their water, because his roots had spread out over the years. Or his branches knocking theirs when the wind blew. He tried not to blow about, but if the wind blew him then there wasn’t much he could do about it. He tried producing fewer leaves so he shaded them less, and used less water, but they didn’t seem to complain any less. If anything their complaints just got louder. The animals tried to encourage him, saying how good his leaves were for nests, and how much they enjoyed eating his nuts all through the winter. So for the next few years he concentrated on trying to make the animals happy by growing some extra leaves, even if it meant increased criticism from the other trees. But it was getting harder and harder for him to produce a good crop of nuts for the squirrels because the bees weren’t able to fly so easily around the four trees in the sunshine to pollinate their flowers. One by one, the other three chestnut trees gave up the fight. For they were suffering just as badly as the tree in our story. The tallest, who used to get angry at the young upstarts, as he called them, got hit by lightening. Then the smallest, never the most confident, succumbed to the fungal disease that had been threatening him for decades. Finally one night a huge wind blew up, and the third brother was blown right over, taking several young saplings with him. It was the birds who brought the news first, then the squirrels, and finally the hedgehogs, that the third tree was lying with his roots in the air and was dying. But he already knew, could feel the energies withdrawing and his brother’s voice fading. That winter our Chestnut tree felt ever so lonely, surrounded by a jungle of younger, stronger trees. When Spring came they burst into leaf before he did, and when he put out his flowers in Summer there was no one to share pollen with, for he was not a type of Chestnut that could set his own flowers. There would be no nuts for the squirrels any more, and after a bit they stopped visiting. He went into a decline after that, putting out fewer and fewer leaves each year for the next three years, for he saw no reason to carry on. He would be better joining his brothers, he thought. Let the other trees have the space, and he could be used for timber. You see he was desperate to still be useful somehow, and that was the best idea he could come up with. Then news came that the Baronet, who you know was the twelfth and last of his line, had died. There being no children to inherit, the park was divided up and most of it was to be sold off in sections. Surveyors came and put up fences; For Sale signs were erected. The other trees chattered continuously, as did the birds, trying to find out who had come to look and what it might mean. One day the rumour said housing, another day it was a timber company. The following week it was a preservation charity, and then some said a shopping centre which got them all into a panic, for who wanted trees where they needed car parks and warehouses? The Chestnut tree ignored them all. After he had seen new pine and wire used for the fences, instead of the good Chestnut wood that was lying there and that would have lasted many more years, he didn’t want to be part of things any more. 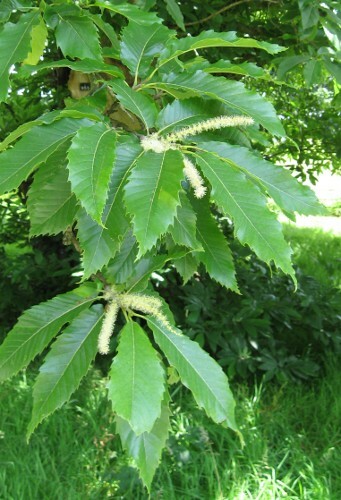 Then one day in late Spring, another rumour went around the lawn, one that even our Sweet Chestnut tree couldn’t help hearing. They had been officially sold, and the new owner was coming for a full inspection. It was a woman, the rumours said. Well that made a change, the Chestnut tree thought. There had never been a woman in charge here, not in his lifetime, and there were none older than him this side of the house. She’s coming, she’s coming, went the whispers. He tried not to care. He was a sorry excuse for a tree now, and would rather not be noticed. Then he heard a familiar voice. He finally looked up. He knew this lady! She was one of the last of the children to come and play under his branches. He remembered her doing endless cartwheels all around his trunk; he tried to avoid dropping his prickly shells where she might put her hands. She looked strong for her age, solid and well-built, although her hair had turned white. But she couldn’t really be pleased to see him, surely? She had a clipboard and pencil and seemed to be making extensive notes, but he had no idea what about. Nor did the birds who kept flying over to try and get a look, or the squirrels who tripped over her tape measure and ran off with one end of her plastic ribbon, making her laugh. “Hmmm,” and “Oh yes!” and “Good, good,” was all she seemed to say to herself. The next thing he knew, many of the young trees around him were being cut down. Soon the only ones left were those around the edges of the new field, that would give shelter, and a couple of hazels at the far end of the field. Well that was a sudden change alright. He looked at his sparsely-leaved limbs in surprise. He could do better than that! The mulch that was spread around his feet seemed to give him new vigour and helped his growing efforts through the Summer. When Autumn arrived, new trees were planted. Three new sweet chestnuts just where his brothers had once stood. Also some more hazels in one quarter, along with cobnuts in another, walnuts along the Northern edge and goodness, was that almond trees being planted over there to the South? She really wanted nut trees? Why? he wondered. The following year he sent out as many flowers as he could. He wanted to be the best he could be. The new chestnut trees were all a bit young to have much in the way of pollen, but the bees did their best and he set a small crop of extra large nuts. He really hoped the lady would come and pick them to roast over her fire once again. However their new owner didn’t seem to want to come and rest or play in his shade, nor go for many walks. But as the heat of the Summer started to fade away, she reappeared with a younger man in tow. He seemed to have a whole truck load of things made of chestnut. Yes, it really was his wind-blown brother, made into benches, and fencing, and a gate. The lightening-struck brother seemed to be there too, and even some stained stools from the fungal-diseased brother. Our Chestnut tree watched with growing excitement as the benches and stools were put around in a circle under his shade, and a new fence erected nearby. Further away some hazel hurdles were added to the fence line, which seemed to snake its way around the trees rather than be an enclosure. Then more chestnut, and more hazel. What or who was this for? One morning in early September, a group of school children arrived, all in their smart uniforms, to sit on the benches, run around and through the fences, and collect any hazelnuts they could find. They built a shelter using the offcuts of the old trees, and lit a fire in the centre of the field, safely downwind of his branches he was pleased to note, to cook their meal over. And most of all they admired the Chestnut tree as the largest tree in the nuttery, collecting up his leaves and early nuts and making rubbings of his twisted bark. 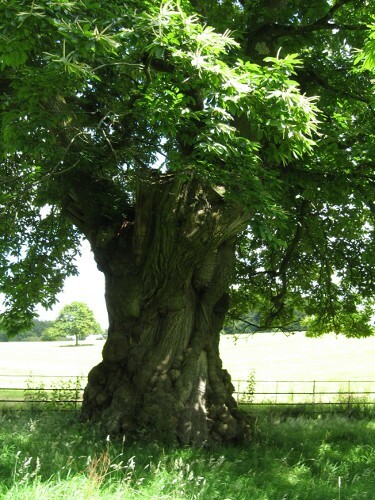 The Chestnut tree was so happy he could burst out of his skin. His spirals almost turned into corkscrews, he was that excited. All through the Autumn it continued, groups of children coming to learn about the trees, their wood, the nuts, and how to look after them. Winter he knew would be too cold, but groups of adults came to prune the hazels and build more fences, until the children were back in Spring for the almond blossom. And so it continued through the year, and has continued every year since then. He likes his new role as a teacher, and takes pride in producing the finest nuts, and the largest leaves he can manage. He now hopes to be producing nuts for the next twelve generations of children who come at least, and being the best Sweet Chestnut tree he can be.